Start Whenever, But Definitely Keep Going. "START WHENEVER, BUT DEFINITELY KEEP GOING." 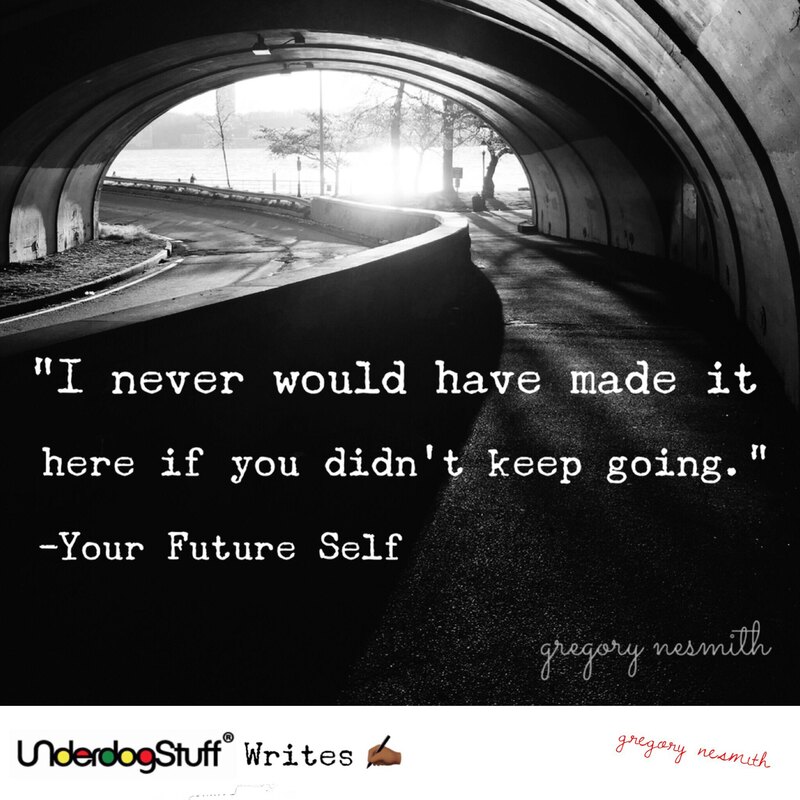 Hello everyone and welcome to the new article series called “UNderdogStuff® Writes!” Recently, I talked on The Gregory Nesmith Show about getting started and keeping the grind going. TGNS celebrated its first year in November! The team, Asha Davis, and I have done 50 shows now for UNderdogs, my people, and the occasional Trump supporter who accidentally finds the show. Just a year ago I had this dream to create a talk radio show, but it was just a dream. When I voiced my thoughts about getting started I encountered a lot of criticism. A lot of people asked if I had enough experience, if I had waited too long, and if I was too old. I had my doubts sometimes too, but I didn’t let them stop me. I got started and it was one of the best choices I have ever made! It’s not too late for you to get started doing something that you love. Lots of people start passion projects and/or businesses later in life. Mark Zuckerberg started Facebook in his late teens, Steve Jobs started Apple in his twenties, Oprah Winfrey started Harpo Productions in her thirties, Jeffrey Brotman started Costco in his forties, and Joseph Campbell was over fifty when he started Campbell Soup Company. I know sometimes it sounds dreamy and optimistic when people say it’s “never too late” but it’s true and above is some of the proof. You will be so glad that you started. Before I got started, I thought that getting started was the hardest part. I have now learned that in the grand scheme of things getting started is one of the easiest parts of a journey. Think of how many things you have started. I know I’ve started way more things than I’ve finished. The hardest part is staying consistent and keeping the grind going. You will get started and going and then life will hit and pile on. You’re going to be busy and tired and you are going to want to slack off or quit altogether, but you can’t. Just keep grinding and eventually it will pay off. “Sometimes it takes years for a person to become an overnight success” - Prince. Just because you want something right now doesn’t mean it's going to happen right now. There are many reasons for this on the journey. It takes time to sharpen skills, grow awareness, and sometimes people just aren’t ready for you yet. The most important thing is that you are in the game playing, that way when the opportunity for success comes around you are ready to step up and take it. You have to remember that your measure of success isn’t only about you. It includes the value you create for others too. UNderdogs, you can’t be too hard on yourself along the journey and you have to remember to feel accomplished along the way. When ‘TGNS’ first got started, I of course wanted instant success and I’m sure you will too. You just have to remember if you don’t have instant success it is okay. As long as you are growing and working towards your calling you can consider yourself successful. Take 'TGNS' for example, it is almost the end of the first year and the podcast of the show had over 13,000 downloads and over 1,000 people a month are tuning into the Facebook Live too. So at this point we are getting about 2,000 views and/or downloads a month in the first year; that’s not bad. A lot of companies take a while to become super successful. Facebook took at least five years to make a profit, Amazon took over ten years to become the number one online retailer, and Netflix took 13 years to knockout Blockbuster. You are never too old to get started on something! Remember that getting started is the easy part but to keep going is more difficult. Even if you don’t see overnight success, you get to choose to stick to it. Once you get to the point in your life where you are successful, you will be so grateful that you got started and rewarded that you kept going. That is all for now and I’ll end with my favorite quote: ‘UNderdogs, can’t nobody do it like you do it, NOBODY!’. -G.N. Originally published on One Idea Away.